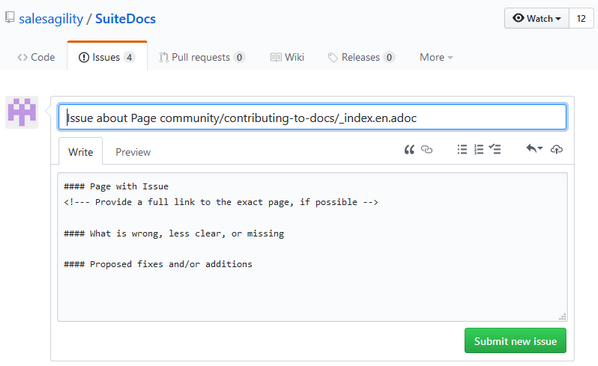 In order to contribute to the Documentation efforts, you can open issues regarding pages directly on GitHub which is the repository of our content. You need a Github user account to open issues on the SuiteCRM Documentation Site. If you don’t have one yet, you will be given the opportunity to create one during this process. Simply use your browser to go to the relevant page. You can use the menus and search feature to facilitate this. Every page on the site has an "Issue" link near the top. You are taken to GitHub where a text editor will allow you to edit the Issue. It’s important to realize that these Issues are about the Documentation page, not about SuiteCRM itself. So please direct any technical questions or feature requests to the Forums. Here, you can ask about something that needs to be clarified in the Documentation, suggest an additional aspect to cover in this page, or tell us about anything that you found wrong about the page. When you’re done, click the green button at the bottom that is labeled Submit new issue. 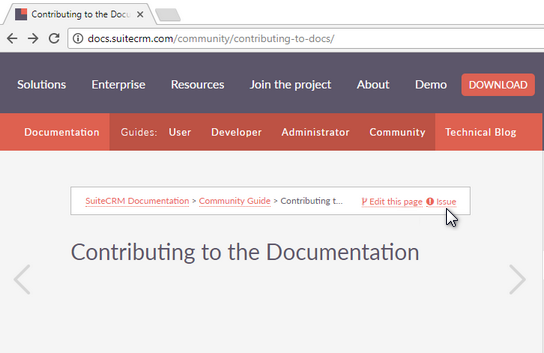 Your proposed Issue is now up handed over to the members of the Community in charge of the SuiteCRM Documentation site. They will receive an e-mail notification as soon as you finish your Issue. You can check the status of every Issue, and participate in any discussion about them by visiting this list. Every small contribution matters! Thanks for helping out.